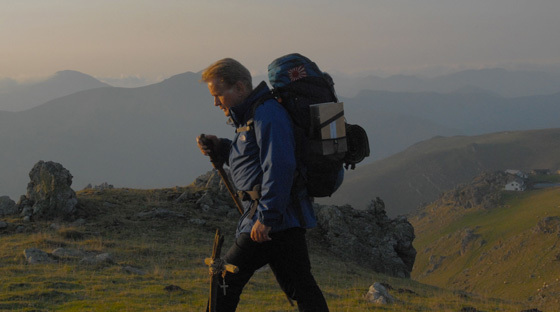 When you decide to fit in an almost two and a half hour film about a man hiking an 800 kilometer trail through Spain at the 2010 Toronto International Film Festival, you do begin to fear whether the time might be better served elsewhere. Arriving at the gorgeous Winter Garden Theatre to ushers handing out booklets, (this film has a guidebook? ), only makes you question the decision further. But then director Emilio Estevez came to the stage to help introduce his new work—a very different one from his large ensemble drama Bobby four years back. 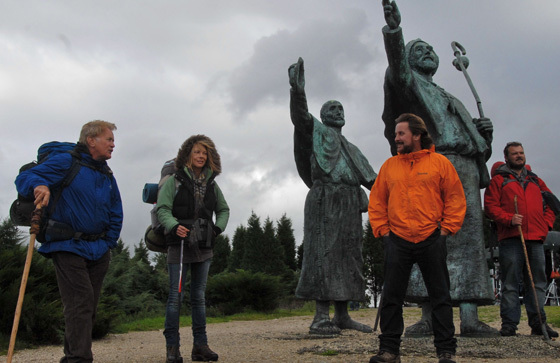 He began to speak of spirituality and the journey one takes along the Camino de Santiago to find oneself through the long cathartic sojourn. Seeking a way to work with his father and at the same time pay homage to their Spanish ancestry, The Way becomes a very personal quest of comprehending what it is to live. Sometimes we can’t understand until tragedy strikes, showing us light through the darkness. With Martin Sheen in attendance a couple rows behind us, Estevez relayed an anecdote from John Huston about how his father Walter was his favorite actor. Saying the same about his dad, you do get a sense that this movie never needs to find financial success for it to be worthwhile to the Estevez family. The process itself surely brought them closer together, traveling Spain during filming and strengthening that bond between father and son—I wonder if Charlie felt left out? The post-screening Q&A did reveal that the cast and crew only walked about 250 kilometers of the full path, but I’ll admit I would have guessed less. It just goes to show the dedication they had in telling this story about a pragmatic, old ophthalmologist and the regret he holds for never having left his hometown. Projecting those feelings onto his adventurous son, he all but calls him a failure for refusing to finish his doctorate in order to travel the world. Daniel (Estevez) wanted nothing more than to do it with his pops, but Tom (Sheen) would have none of it. He has his country club friends for golf, his patients so unappreciative of the help his prescriptions can give that they memorize his eye charts, and the simple life of rest and relaxation. Even when he receives the call about Daniel’s death in the Pyrenees—the first stop on the Camino—his feelings are more of anger and frustration, needing to go retrieve the body while thinking if only the boy listened and stayed home. But something changes once he arrives to see the backpack left behind and the blank ‘passport’ signifying how far along the hike one has gone. He begins to see his son—a ghost with a face of pity and disappointment—amidst the tourists taking the route for their own spiritual, health-conscious, adventurous, or enlightened reasons. Stubbornness in his attitude that Daniel died unnecessarily eventually leads into stubbornness to give his son a proper farewell, deciding to walk the Camino himself, taking the ashes of his son along with him. As any film portraying an extended journey through exotic locales, there are numerous montage-type collages of time-lapse distance set to music. The soundtrack culled together for these scenes is impeccable with The Shins, James Taylor, Coldplay, David Gray, and Alanis Morissette included. Each song progresses the visuals from a sense of melancholy to one of acceptance and an embrace of the challenges ahead. Sheen’s Tom goes through a very gradual and realistic evolution from an unenthusiastic man walking to honor his son into one who has found a reason for living in the void of solitude. He never would have expected meeting people along the way that could shake him from his funk let alone slowly become the closest friends he probably ever had in his life. When you put the Blackberry away, forget all responsibility to anything but your body and soul, and allow nature to overwhelm you, there really is nothing else worth taking your attention away. And whether Tom’s mission began in earnest as a chore or not, the completion turns what first is a dad taking his son home to a son’s spirit waking a father up from the prolonged sadness of a life unlived. You may be thinking that The Way, as I’ve described it, will be boring, repetitive, and, like I did at the start, not worth your time. Well, I’ll tell you now that it is none of those things. Estevez has fleshed his father’s role out completely, going through the good and bad, using flashbacks and sarcasm to show the kind of man he has become. The inclusion of his on-and-off Camino partners not only serves as a mirror to his regret, showing him glimpses of his own pain in order to let go, but also as comic relief. Yorick van Wageningen’s Joost, (looking to lose weight and fit in his tux), Deborah Kara Unger’s Sarah, (trying to rid herself of cigarettes), and James Nesbitt’s Jack, (a case of writer’s block hampering his new book), really help fill the film with a constant infusion of intrigue and humor. Those reasons as to why they are walking are what they share at first, just as Sheen hides the box of ashes at the center of his quest, but the journey soon uncovers the real events that have brought them all together, awaiting their spiritual release at the end. All involved really surprised me by crafting a story with equal parts religion, (both questioning and devout faith), adventure, gorgeous scenery, and emotionally authentic characters. Every rest stop along the way is at a complete stranger’s home with bunk beds a large communal dinner—the house owners expect travelers to arrive at all hours. There are awkward meetings with the likes of El Ramon and his genial schizophrenia or dark moments of drunkenness and gypsy thievery. But even in the moments of failure, there appears to be someone of compassion and morality, like Antonio Gil’s Ishmael, to show the disparate cultures along the path through Spain. I may have enjoyed it all more due to my own penchant for hiking mountains and the like—thus far landlocked to Northeastern America—but I think it will resonate with anyone who’s lost a loved one or has been wrestling with his/her own emotional escape. All I know is that if I complete the Camino de Santiago—because it is now on my bucket list—I’ll reply to their query of why I came with these words: Emilio sent me. 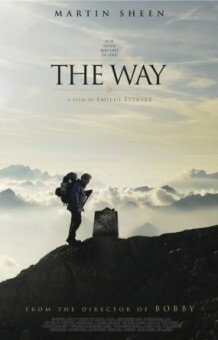 The Way is now in limited release.